When it comes to pillar candle lighting, many people think of wedding ceremonies. However, there are other meaningful services in which thick pillar candles are displayed and lit. Pillar candles are the more robust members of the candle family. Not narrow and long like tapers, pillar candles are round and wide. They are usually two to three inches wider than votives and anywhere from six to twelve inches taller. These sturdy candles can be purchased in white, cream, or ivory, which is usually the color scheme chosen for wedding ceremonies. They are also available in brighter colors like blue, green, amber and scarlet. Some are scented with pleasing aromas such as vanilla, strawberry, or melon. Often the candles are unscented, however. People enjoy decorating with pillar candles. These candles can be placed on the center of a dining room table in a candle holder, or set inside a wall hanging. They can be displayed in any room of the house. Outside, you may use candles in your patio or on your deck. Lit candles provide an inviting atmosphere to any part of your home. Arrange a few on the fireplace mantle. Place two or three of different colors on an end table by your sofa or favorite lounge chair. Light them and enjoy the ambiance these candles create in the room. A popular use of a pillar candle is known as a unity candle. A unity candle is lit during a wedding ceremony by both the bride and the groom. The ritual of lighting a unity candle is not connected to any particular faith, so it can be performed by couples of any religion. Perhaps you have been to a pillar candle lighting ceremony. In a unity candle ceremony, both the groom's parents and the bride's parents each light a separate taper candle. The candle lit by the bride's parents represents her as an individual. The candle the groom's parents light represents him as an individual. Then, the bride and groom take those individual taper candles and use them to light a larger pillar candle. 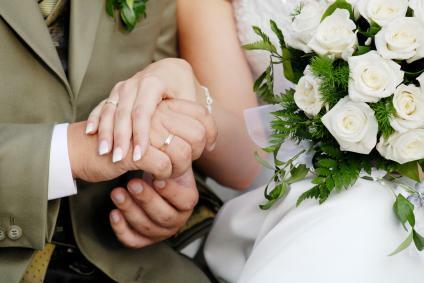 This symbolizes the coming together of the bride and groom, and the two families as one. This candle is usually white, off-white, cream or ivory to represent the purity of the wedding ceremony. Unity candles are unscented, in case someone at the ceremony has an allergy to strong scents or perfumes. Of course, this candle lighting takes some preparation before the wedding begins. Usually, someone places the taper candles on a table by the altar of the church. A good idea is to make sure someone is responsible for bringing a lighter or matches. A pillar candle is lit in an Advent wreath. Generally, as the parents and couples are lighting the candles, light music is played. A suitable selection is played on the piano or organ. After the candles are lit, at the conclusion of the unity candle ceremony, the bride and groom each present a flower to their parents. During the Christmas season, Advent is celebrated. Advent is the time leading up to Christmas Day. Many churches have an Advent wreath with five candles on a table in front of the sanctuary. These candles represent the four Sundays before Christmas and are lit each Sunday in a service where Bible verses are read. 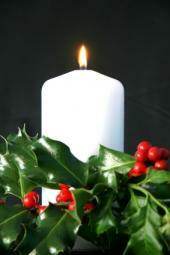 On Christmas Day the largest candle, usually a pillar candle, is lit. Memorial candles are often pillar candles. These are lit in ceremonies honoring the deceased. At weddings, if a member of the family has passed on, a pillar candle is lit to honor his or her memory.